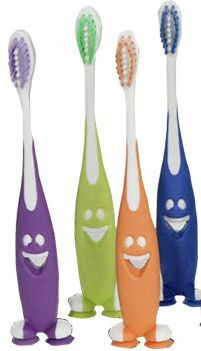 Ideal for your young patients, this fun toothbrush has dual suction cup feet for easy storage. Assorted bright colours. Small oval head design has 22 tufts of soft round ended Dupont nylon bristles in three rows.